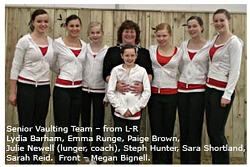 Great Britain's Joanne Eccles won the Individual Female Technical Test in the Vaulting Championships at the WEG today. Photo: FEI/Kit Houghton. Lexington, 8 October – The German team, ably assisted by longeur Alexander Hartl, won the first round of the Freestyle while Great Britain’s Joanne Eccles and Switzerland’s Patrick Looser topped the Technical Tests in the Vaulting Championship at the Alltech FEI World Equestrian Games in Kentucky, USA today. Germany finished with a score of 7.698 to pin Austria back into second place, and for the host nation there was deep disappointment. The American team, leading after the Compulsory Test, had to interrupt their Romeo and Juliet themed Freestyle when a movement fell apart. There were no apparent injuries however and they went on to complete their test but had to settle for third in the Freestyle and third overall. 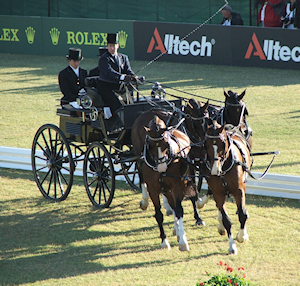 Daily radio coverage of the 2010 Alltech FEI World Equestrian Games continues with a wrap up of the day’s events. We recap the Jumping Team Finals, Para Dressage Individual Championship Tests, Combined Driving Dressage and Vaulting Individual Freestyle today as we record at the International Equestrian Festival in front of a live audience. Listen in. Germany's Simone Wiegele heads the leaderboard after today's Female Individual Freestyle Vaulting Championship at the Alltech FEI WEG. Photo: FEI/Kit Houghton. Lexington, 7 October – The Alltech Arena at the Horse Park in Kentucky, USA was packed to capacity today for the first round of the Male and Female Freestyle Vaulting Championships at the Alltech FEI World Equestrian Games. And a superb performance from Germany’s Simone Wiegele clinched pole position in the Female division while Switzerland’s Patric Looser now heads the Male Freestyle leaderboard. Scores from yesterday’s Compulsory Test and today’s Freestyle decide the current standings. The crowd really got involved with every test, hardly able to contain their enthusiasm until the end when, time after time, they burst into waves of spontaneous applause as the 20 Male, and 33 Female vaulters put on quite a show. October 6, 2010 – Lexington, KY – The Vaulting World Championships swung into action today at the 2010 Alltech FEI World Equestrian Games, with the compulsory portion of both team and individual competition being contested at the Alltech Arena. Today we covered Para, the start of vaulting with an early lead by the USA and driving starts tomorrow. Plus, Glenn went on a quest to find adventure at the horse park! Listen in to what happened with that…. See all of the videos and pics from today on Facebook. The final countdown begins as more teams are announced. Plus, we catch up with two more of our spotlight athletes as they prepare to leave for Kentucky, and speak with world famous trainer Pat Parelli about his appearances at WEG. Listen in. News: The Australians have announced their squad for the Three Day Event at the 2010 Alltech FEI World Equestrian Games here in Lexington in a couple of weeks’ time. Last week’s guest, Eventing Safety John, predicted it almost on the money, but for one horse – nice one, John! News: New Zealand has announced its eventing squad that will head to Kentucky shortly to contest the World Equestrian Games, and it features a mixture of experience and young blood. News: Ireland also announced their eventing squad, and after some shuffling around in their travel arrangements, they are now sending six horses instead of five as originally planned. News: WEG ticket sales heat up. News: Alltech has come to the financial rescue of the WorldEquestrian Games, as the 2010 Foundation makes budget cuts to the tune of half a million dollars. News: Matthew Zimmer wins the Alltech YouTube contest for most viewed video and snags a pair of opening ceremony tickets and a thousand dollars. News: Jose Ortelli will be the only rider representing Argentina in the Three Day Event at the World Equestrian Games and has been training here in Lexington for the last couple of months.